It is the age of being digital and having a strong presence in the digital and social media is a necessity and Axis Bank is no behind. I was a part of the privileged few bloggers to be a part of the ‘Axis Digital’ event organised by Blogadda held at the bank’s corporate office. The event was wonderfully organised, starting with a nice breakfast which led to the interaction with fellow bloggers and the head of the bank’s media relations. After a couple of rounds of tea and a healthy interaction we were led to the conference room where it all began. 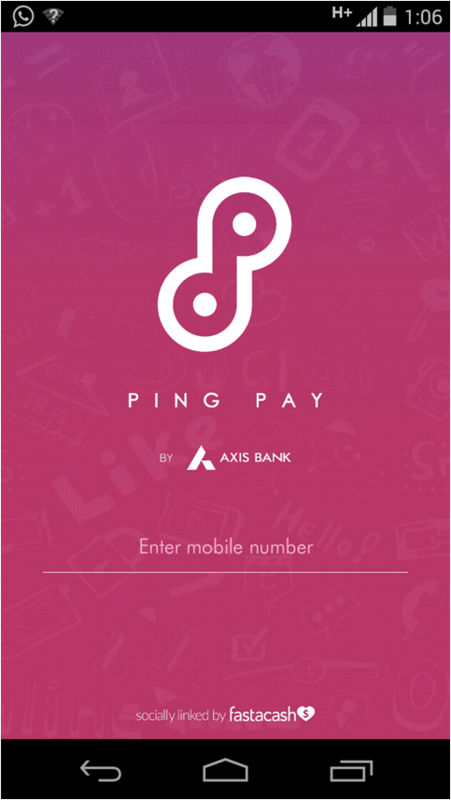 Ping Pay’ is a unique multi-social payment solution to enable customers, especially the youth and smart phone users, to transfer money and mobile recharge, person-to-person, including to non-Axis Bank account holders, using social and messaging channels like WhatsApp, Facebook, Twitter, Email and Phone Contact lists. Isn’t that great?!! All we have to do is load the app on your smartphone and you can then transfer or ask for money and even recharge for a particular amount. Of course, all the above is simply not possible with stringent security at all the levels of a particular transaction. The security features are locked it at the on-boarding level as well as the transaction level. So there is SIM locking, Device locking and OTP at the on-boarding level and Ping Code, Fastalink which is locked to a profile and cannot be forwarded as well transaction limit of 50,000 per day per transaction. So the application has made sure that there is no security issues at any level. Once you have loaded and app, let us now see how to proceed with the application in a series of pictures so as to simply for you. This is how the Registration process takes place. And this is how the registration takes place. 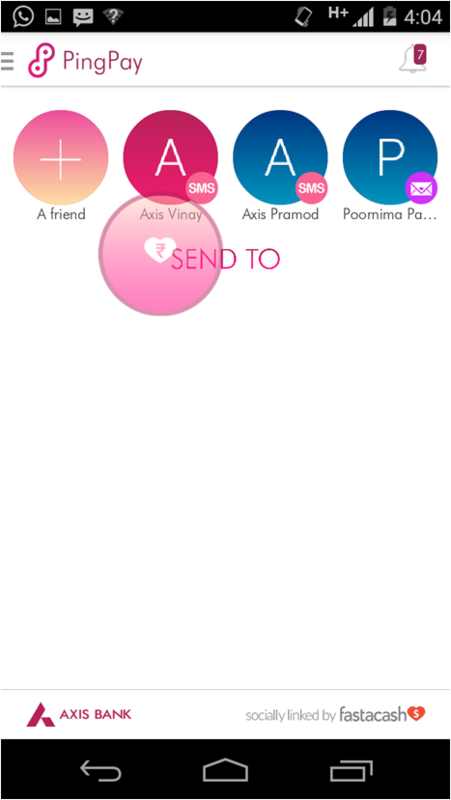 The application has a feature that work on gestures. 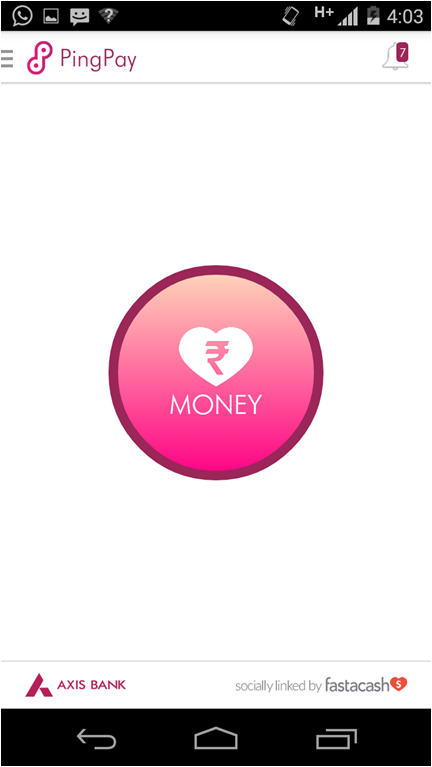 It has a bubble placed in the centre and when you move it up or down, it ask for sending money and receiving money respectively which is a user friendly interface. You can also attach a picture, audio or a pre-loaded messages to the transaction and make it a more fun way to ask or send money. So all you have to do is drag the bubble towards the upper part of your screen where you will see the preferred mode of payment as well the list of contacts. 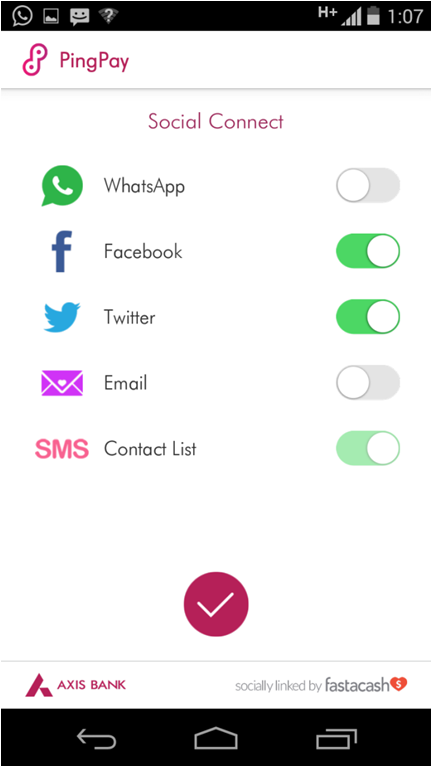 You can search from your contacts from your Facebook, Twitter, Whatsapp but all the contacts need to be stored in your mobile. As I said earlier, that the security is extremely tight and one more feature which makes is so secure while transacting is the Mpin. Thus before starting with any transaction it will ask you for Mpin which is all of your choice. So there is no question of you receiving any pin. It is punched in by you as per your likings. So there are no chances a transaction going wrong. So as you see from the above pictures, there is a customized pre-loaded message applied before confirming the transaction, along with ping code which will be shared with the receiver via sms after which a fastalink is generated for the intended receiver. 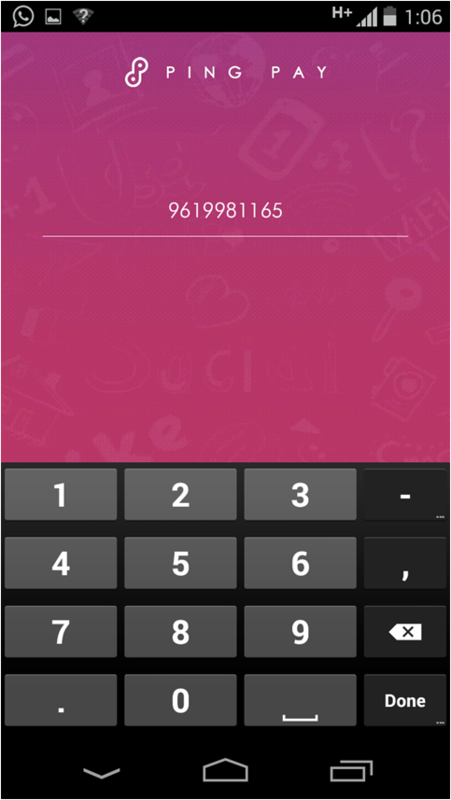 This link will be received by the receiver when the receiver logs into the Ping Pay App. This transaction is valid for 15 days after which the money will automatically be credited to the sender’s account if the receiver does not accept it. 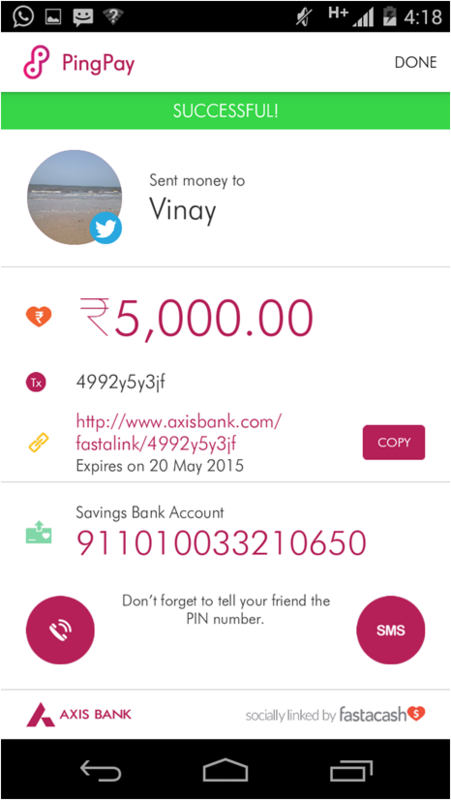 So let us see the brief for the social app called Ping Pay by Axis Bank. Ping Pay has been developed in partnership with Fastacash, a Singapore based, venture-capital backed firm. Fastacash’s technology enables value (money, airtime, coupons, etc) transfers, along with digital content, across any social network and messaging platform. The company brings it technology to end users by partnering with banks, mobile operators, remittance companies, payment service providers and mobile wallets. The app provides an innovative, gesture based user experience that enables money transfers without having to type in the account number and the IFSC code. 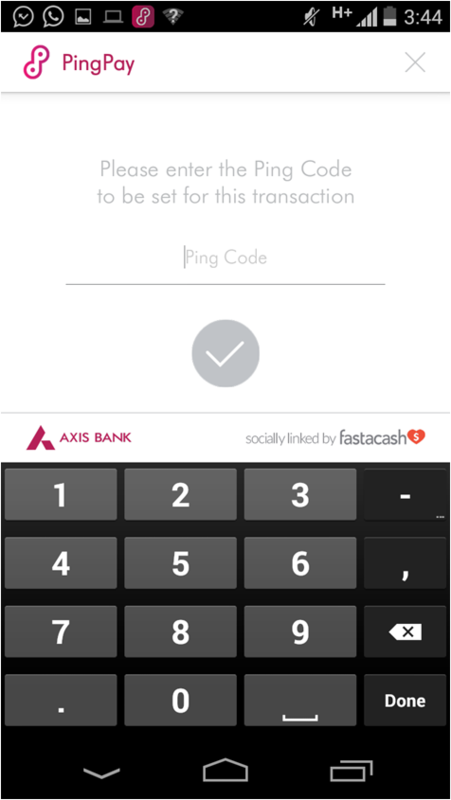 Sending or requesting money or mobile recharges with the Ping Pay app takes a few simple steps. 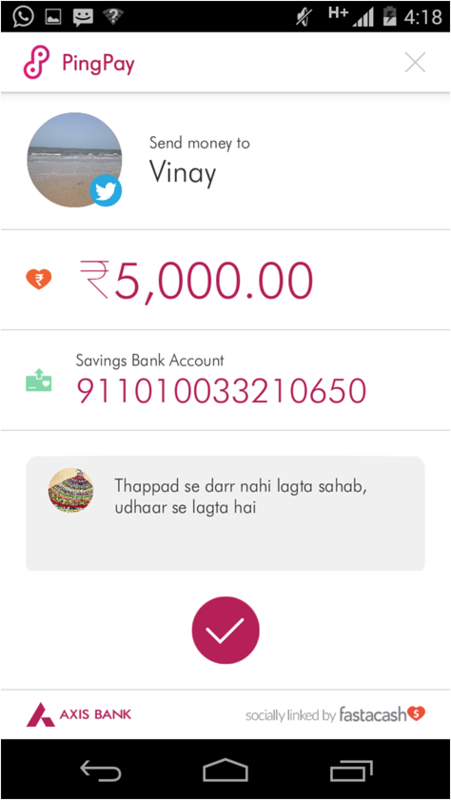 When sending money, the user chooses a social or messaging channel and selects the name of the person to whom the money is to be sent. 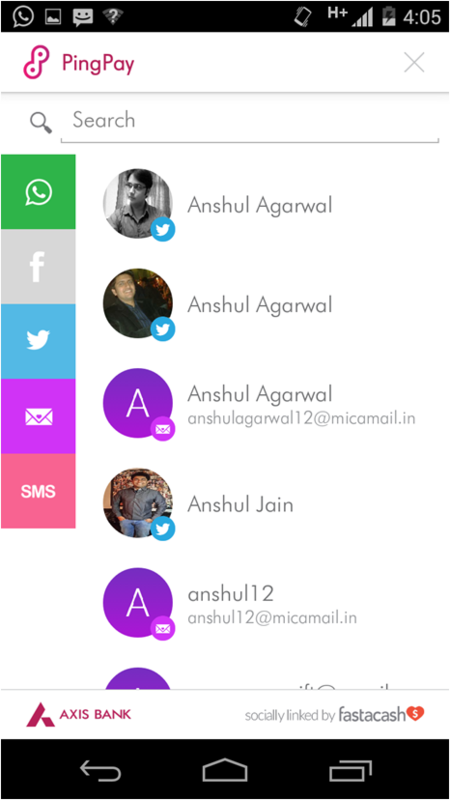 They enter the amount to be sent and set a “ping code” that is shared separately with the receiver. Upon confirming the transaction, the money is immediately sent and the receiver gets a message across the social or messaging channel selected by the sender. The receiver has 15 days to transfer the money to his/her bank account using IMPS. In the event, the receiver does not claim the money received within 15 days, the transaction would be auto-reversed to the sender’s account. 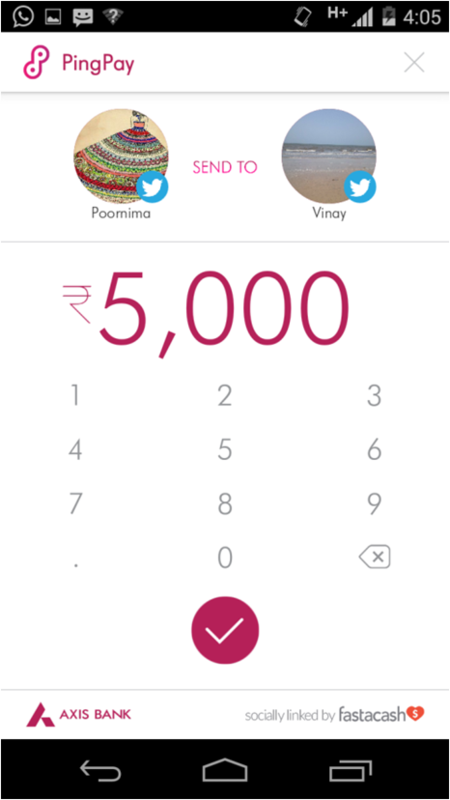 Ping Payalso has ‘Ask for Money’ and ‘Ask for Recharge’ options, which would allow the receiver to put in a request for funds and also seek recharge from their friends and family across social. Overall it was a wonderful experience interacting with the banking professionals and discussing about the app. Thoroughly enjoyed the meet. 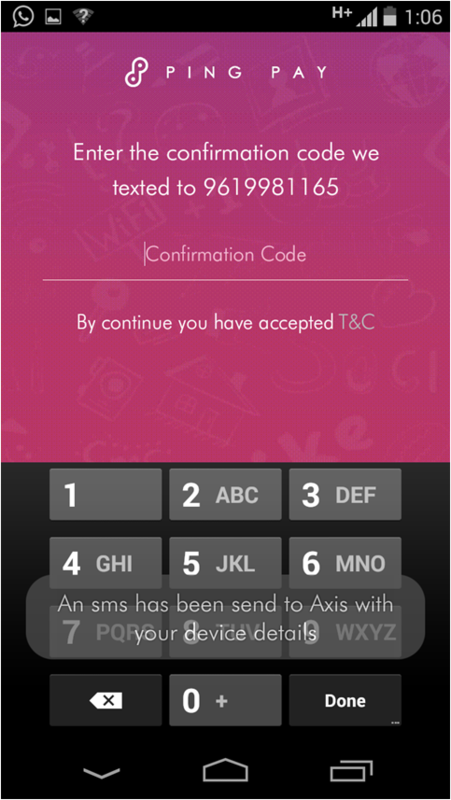 Thank you for the invitation Blogadda and Axis Bank.